The gold market looks like its finally put in a bottom but this is a very recent development and things could still go awry. I don’t really expect that but there is still the actual start of tapering to contend with. Wall St expects that next month and isn’t pleased at the prospect. I don’t expect “apocalypse Wall St” but given the strong run a 10%+ September-October correction would be neither shocking nor really that scary. The big news in the past couple of weeks is both China and Europe putting up better than expected economic readings. Any sort of positive surprise from these two areas is going to help commodities. It may also help to explain the continued relative weakness of the $US in the face of better economic readings and higher bond yields there. All in all, things seem a bit better this month. That isn’t reflected in resource stock prices yet though things are firming up. The still weak volumes speak to the usual empty trading desks of August. The real test of sentiment comes next month but things are looking positive so far. 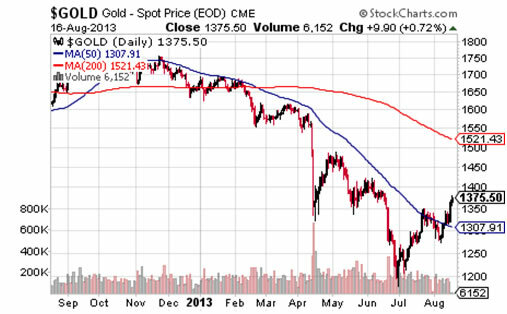 As this issue was written gold managed to push decisively above its 50 day moving average. As you can see on the charts below the 50 day MA - the blue line on the gold and silver charts—has been a consistent area of resistance for the past year. Both metals made several attempts to break above the 50 day MA early this year and all failed until the past couple of weeks. Silver has made the most impressive move but then it also suffered the bigger percentage drop on the way down. 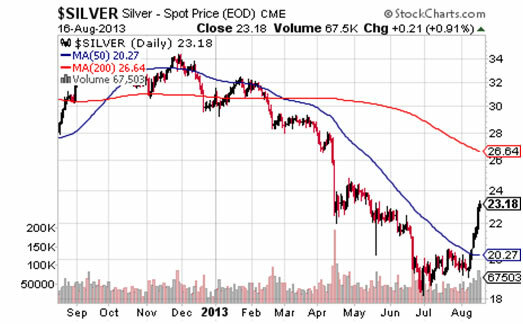 Technically, silver is back in a bull market, having risen more than 20% from its late July low. That move is still in the “one day wonder” category until a few more trading sessions have past and new support tested. Don’t expect the media and general market commentators that crowed about gold and silver going into a bear market to take note of the reversal too quickly. So far, it’s only silver that has moved into a bull market. Gold will need to get through $1400 to match that feat. I expected $1350 to provide more upside resistance than it did. I was impressed with the speed that buying—and a lot of short covering—pushed through this level. $1400 was a support area several times as the gold price fell so sellers could put up much more of a fight there. The more important question is: why now and is this finally a sustainable move? I’m beginning to think this move is something that could last. I’m not assuming gold will see new all-time highs. I hope it does but I’m not thinking that far ahead at this point. For now I just want gold demonstrating a bottom is in with enough conviction that traders return to the sector and Juniors start raising money again. I’ll worry about the potential for new highs later. As to the “why now?” question this appears to be a case of a market running out of sellers. Not a deep and complex answer perhaps but that pretty much sums up how many bear markets end in my experience. Not with a bang but a whimper— until the price starts rising at least. As the gold price was bottoming and starting to move back up news arrived that several large investors including George Soros had sold out of gold. Even John Paulson, one of gold’s biggest boosters, sold half his GLD position in Q2. This is good news. When a market is bottoming the biggest fear is that more large sellers will arrive to snuff out a rally. That could still happen but the fact a couple of the biggest potential sellers are out is good to hear. In the first half of 2013, 500 tonnes of gold was sold by GLD as traders exited the space. This has been one of the main sources of selling. In the past couple of weeks this selling pressure has eased. There have actually been a few days where GLD bought small amounts of bullion in the past week. If ETF gold holdings stabilize that takes a huge amount of weight off the market. Physical demand in Asia remains strong. Gold purchases in India increased in July which is astounding given how hard the Indian government is working to stop imports. Imports have soared to all the countries surrounding India. It doesn’t take much imagination to guess where that gold ultimately ends up. Demand from China and India exceeds mined production. Scrap supply is down due to lower prices. At a basic supply demand level the situation looks set up for a continued rally. The wildcard is selling by traders that fear an end to QE. It may be that the weakest hands are already out however. 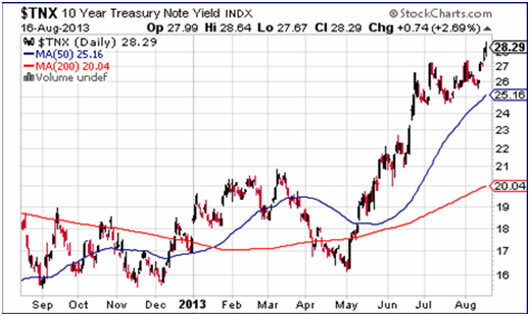 The chart below shows the 10 year Treasury yield. A glance at the right side of the chart (and a look at how NY markets are trading) tells you that traders are expecting tapering—and soon. One of the most impressive things about the gold rally in the past few days is that it’s occurring even while traders are selling equities and treasuries out of fear of near term tapering. The USD has been weak too lately. This is mildly surprising but may reflect moves out of US equities and bonds by foreign holders. Weakening equities in NY was one of several things I thought might start a gold rally. I’m no perma-bear but you don’t need to be. The S&P is way overdue for some corrective selling. This move goes against the gold bug narrative that there will be QE forever. I think tapering does start soon. Bernanke has been testing the waters. Traders are pricing in lower bond purchases by the Fed. There will always be some traders taken by surprise, however. We could still see a spike down in gold when the Fed actually announces QE tapering but it’s encouraging that gold is not following equities and bonds down now. It’s equally encouraging that resource stocks are not following the large indices down either. That’s the first time that has happened in a couple of years. The rally in the Juniors is still quite weak. The bigger test will come in September when we will hopefully start seeing better overall trading volume and some new financings. Autumn is traditionally the strongest part of the year for precious metals and often for resource stocks too. It’s been a long hard grind but if gold can advance through $1400 and hold higher levels we should finally get some relief. Eric Coffin, editor of HRA Advisories, recently sat down with President and CEO of Colorado Resources, Adam Travis, to discuss more about the company, its recent successes and why investors should stay tuned to this story. Click here to download Eric’s interview with Colorado Resources now!